With the Kramer SM-1 Candy Red, the legendary guitar maker once again proves that it knows how to build genuine shredder axes. Accordingly, the electric guitar offers a neck-through construction with neck and body made of mahogany, which, thanks to the "Slim Taper" profile, allows any solo of light speed on the ebony fingerboard to easily get out of hand. Two Seymour Duncan Cool Rails and a split Seymour Duncan JB Humbucker provide the right, extremely hot rock sound. Last but not least, the Kramer SM-1 offers a Floyd Rose FRT-1000 and uninhibited Whammy Bar action. 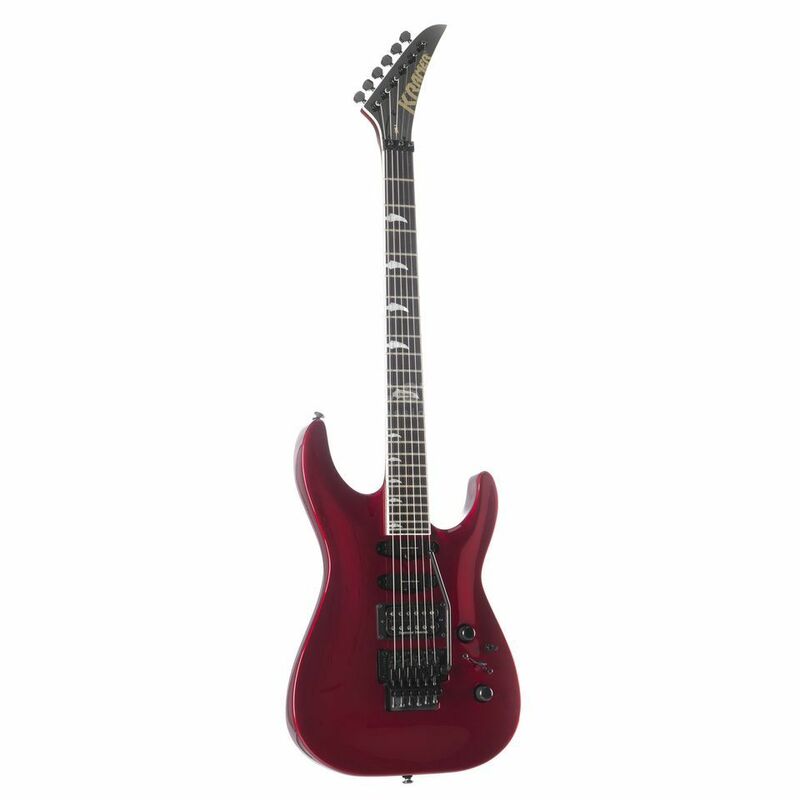 The Kramer SM-1 Candy Red is a genuine shredder axe with high playing comfort and hot sounds. The continuous mahogany neck offers high playing comfort thanks to the "slim taper" profile and smooth transition to the corup. The heart of the Kramer SM-1 is undoubtedly the full-length mahogany neck, which lies comfortably in the hand thanks to the slim slim "slim taper" profile, so that even the most virtuoso solo goes out of hand as if by itself between the 24 frets of the ebony fingerboard. Historic Kramer" inlays mark the layers so that orientation is not lost. Also glued to the neck are body wings made of mahogany, which promise a rich pressure in the sound. A Seymour Duncan JB Humbucker and two Seymour Duncan Cool Rails provide hot sounds at the amplifier. The Floyd Rose Tremolo takes every Whammy Bar action without a hitch. The Kramer SM-1 Candy Red is equipped with hot Seymour Duncan pickups for an adequate sound conversion. The Seymour Duncan TB-4 JB convinces with sharply focused mids and highs that cut through the band sound together with the precise attack. Thanks to the coil split option, authentic single coil sounds are also available. In the neck and middle position, Seymour Duncan SCR-1 Cool Rails also deliver warm yet transparent sounds. On the back of the headstock is a practical holder for the Allen wrenches of the Floyd Rose Tremolo next to the precise mechanisms. As a genuine shredder guitar, the Kramer SM-1 also offers the proven Floyd Rose FRT-1000 tremolo, which, thanks to its double locking construction, can easily take even the most uninhibited Whammy Bar actions without detuning the electric guitar. A practical detail here is the holder for all required Allen wrenches on the back of the headstock, on which Kramer Die Cast mechanics also work.